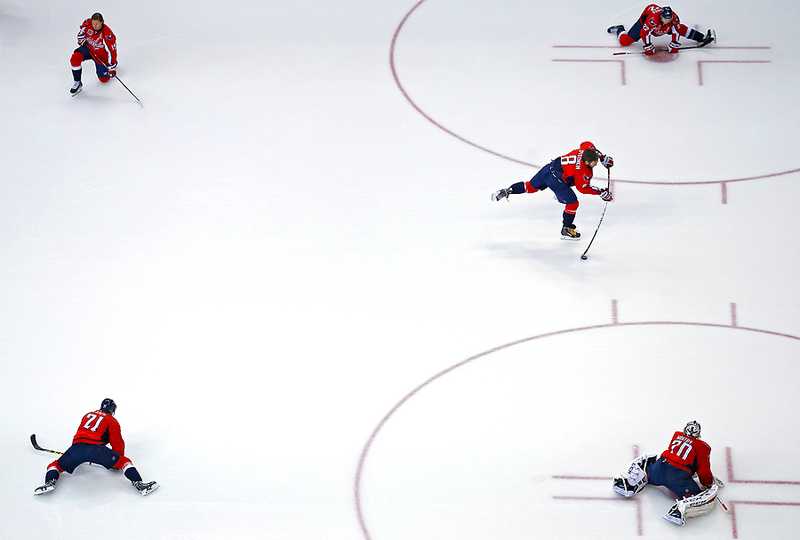 "Alex Ovechkin #8 of the Washington Capitals warms up before playing the Carolina Hurricanes at Verizon Center on March 31, 2015 in Washington, DC." Much like the athletes I am photographing, I need to warm up before the game itself. For the longest time, I've used the brief period of pregame to get my creative juices flowing. Some games I'll walk away with a picture I like. Other games it's more or less a fundamental exercise to clear the cobwebs and prepare for what most important - the game itself. The other night before the Washington Capitals took on the Carolina Hurricanes was no different. The only change was that the game was anticipated to be historic if superstar Alex Ovechkin of the Washington Capitals could score twice. With one goal he would tie the franchise record for most goals scored, while at the same time, complete another 50 goal season. If he netted the puck twice, he'd break the aforementioned record. Needless to say, all eyes were on number eight. So I decided I'd focus on Ovechkin before the game, yet go all the way up the nose bleed section for a change of view. Once up there, everything lined up perfectly for this moment. Compelling or storytelling? Not so much. Yet different and graphic which helped me focus for the moments to come later during regulation that were important for history.